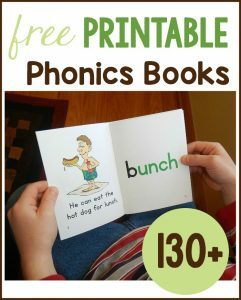 Have you seen my sets of free phonics books? Today I’m sharing set 9! 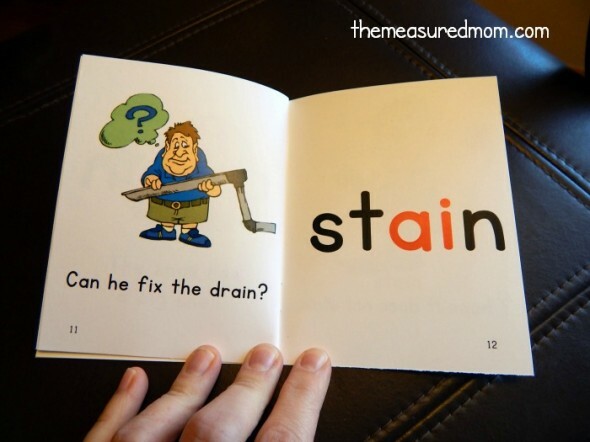 Do you have a beginning reader who is just starting to sound out words? Or maybe you have a reader who struggles with sounding it out. Each word is laborious and painful. Reading just isn’t fun. Short little books that you can download for free. They’re easy to assemble with no cutting required! 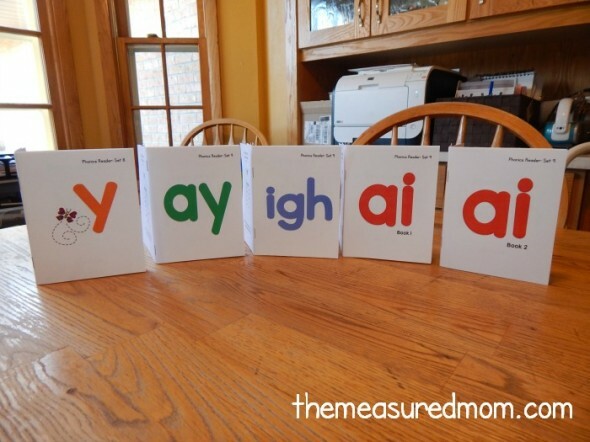 Use them to give focused attention to a particular phonics pattern. Does your child have trouble with silent e? Pull out that set. Are you and your child bored with flashcards? Try these. Each new word is all by itself on a page before turning to see the sentence and picture. It’s like a flashcard, but much more interesting. 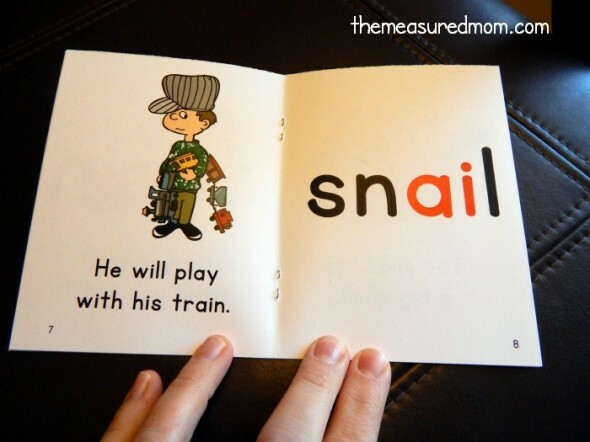 If you’d like, read the sets in order to give your child a slow and steady introduction to phonics patterns. 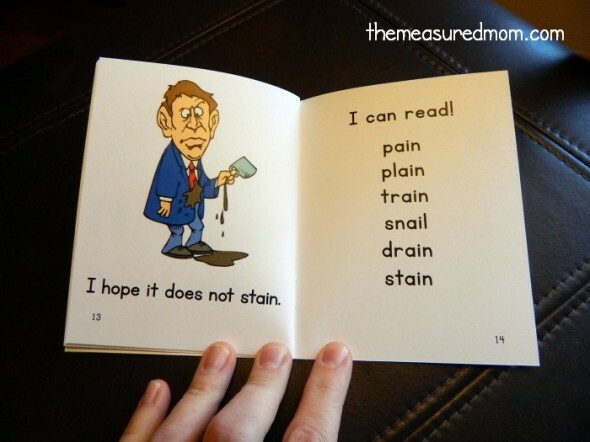 You might want to read these books alongside my free sight word readers. 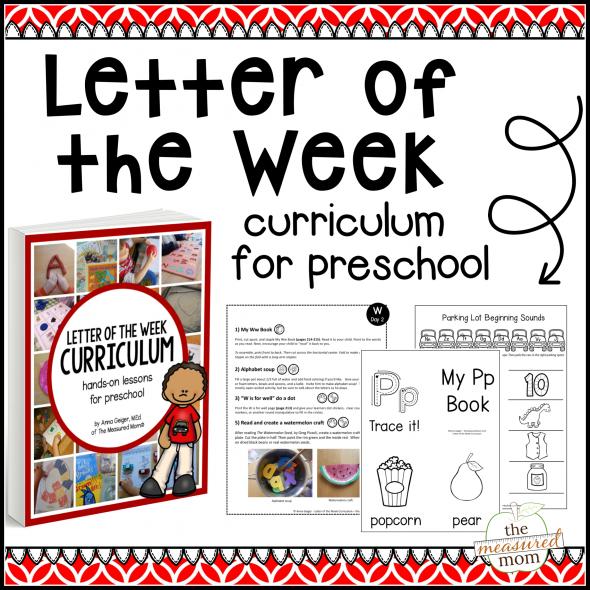 It’s the best of both worlds: my sight word books promote the learning of high frequency words and reading with context clues; my phonics readers bring focused attention to letters and their sounds. Each book starts like this. See how you have to read the new word before you get a picture clue? I use silly pictures whenever I can! 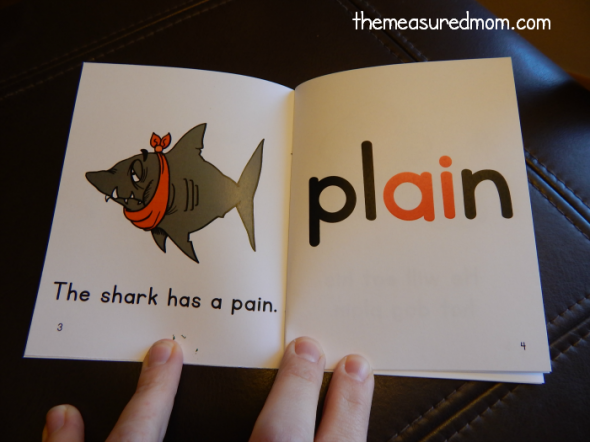 Each page has some sight words we’ve already learned (he, eat, his) along with words your child has learned to sound out in previous books (will, hot, dog). Of course, the focus word is also part of the sentence (plain). By now you’ve noticed that these are not actual stories. 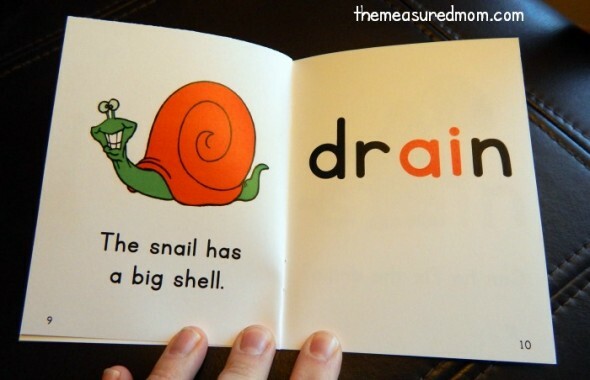 Rather than force a story with a particular phonics pattern, each book has a series of unrelated sentences. 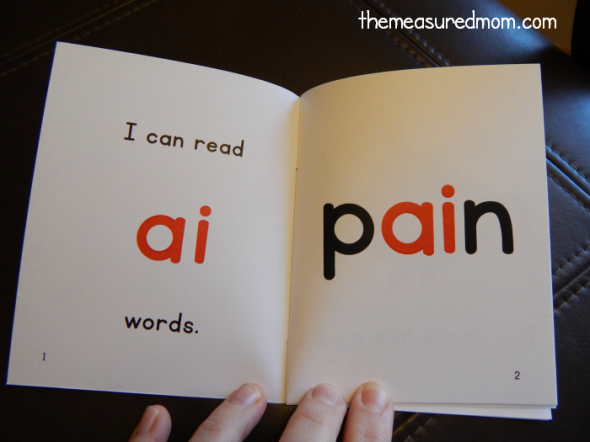 The last page gives your child the opportunity to read each focus word again. He might need to turn back to look at the pictures for help. That makes me very happy, Kari – thank you :). I really loved the books. Thanks so much!!! Loving your site! I have a little girl with ASD, ADHD and ODD. Trying to keep her afloat in the classroom. Your site looks like a god sent! Thank-you! Have just stumbled across your site thanks to Pinterest and it looks like a god sent! I have a little girl with ASD, ODD and ADHD. I do my best to try and keep her afloat with what is happening in class. Hello, Edeana! I’m so glad you’re finding things here to help your little girl (I didn’t quite catch if she’s your daughter or student ;). Blessings on your work with her! Thank you. I love the way you put the target word on the previous page. Which set is the typo in, David? I’m not finding it. Thank you David, I finally had a chance to fix that typo in my phonics reader. Thanks for catching it! These look amazing. I really need them and I have been unable to open or save them from 3 different computers. I don’t know what the problem is. Is there any way that you can send me a file of these books to see if that way I will be able to print them? Thank you for all of the resources you share. I’d love to know if one of these solutions works for you! Thanks for your help with my youngest struggling readers. I am SO glad I found your website! I love these books. They fit perfectly with my Orton Gillingham instruction while I tutor my students with dyslexia. Thank you for making individual books for each sound. This is so hard to find. I’m very grateful you offer them for free and have such great instructions. Thank you! I’m glad you found me, too, Amy, and I’m so happy these work well for your students. I hope you find a lot more here that you can use! Thank you so much. I am yet to use it but finding it alone after searching for a long while now makes me very happy. Thanks so much Anna! Just wonder if Phonics Book Set 8 is missing? I’d like to print your readers for a school in the South Pacific. It is extremely hot and humid in this village school. What would you suggest I do in the assembly of the books to extend the their usage? That’s a great question, Clarice, but I’m really not sure. I wouldn’t laminate them with regular laminate because it will make the pages too stiff to turn. I always print on cardstock and they hold up well, but we do not live in a humid environment. Greetings ! My heartfelt thanks and appreciation for all the things you are posting..it really helps me to supplement my son’s education. 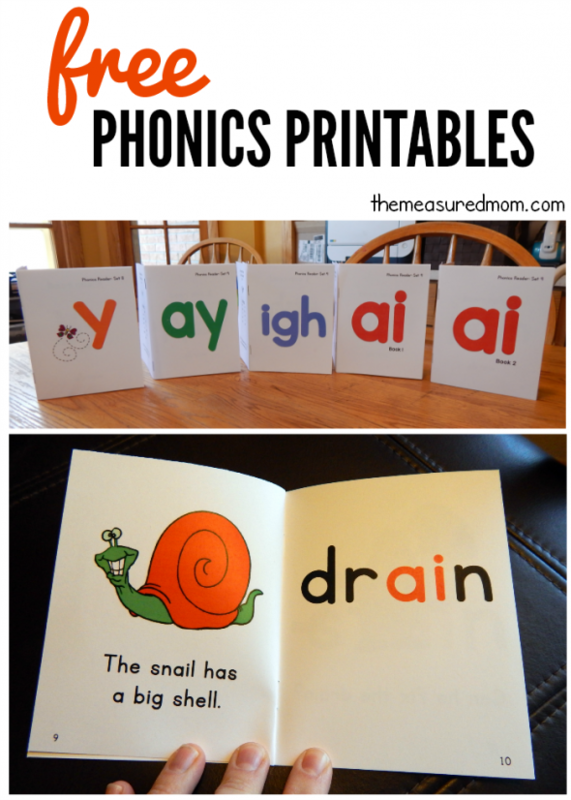 I want to purchase phonic books on blends , diagraph etc….just the books though and not the worksheets. Please do send me a link when you can spare the time . Hello! I’m sorry, but the bundle come with both the books and games; I don’t offer just one or the other. This is Kate, Anna’s assistant. I’m sorry you’re having trouble! Please be sure that you entered your email address correctly, and then check your spam/junk/trash/promotions folders. If you still can’t find it, you might want to try using a different email address. Some teachers have trouble because their school districts have very strong filters that keep files from coming through to their work addresses. Thanks for giving it another try! This is Kate, Anna’s assistant. I just tested the link with my own email. After I clicked the green download box on this page, I entered my email address. I found the email from Anna, and I opened my email to find a brown box at the bottom that says, “Click here for your free printable.” Then I clicked it and the file opened up. What happens when you do this?